Christmas gifts can cause a fair level of uncertainty, possibly even leaning towards angst, on the part of the giver. Are we sure whatever it is that we are looking at is something that will really “fit” the intended recipient? Someone on a list out there (family/friends/significant others) might even fall into the category of “extremely difficult to buy for”. So what to do? We decided earlier in the year that we would make gifts for everyone on our list this Christmas, some of which will blend woodworking, leatherworking as well as metalworking. I’ve been honing my knife making skills (some may have seen a few of these on my Instagram account @LeeLairdWoodworking, or my personal blog) which is tying together woodworking and metalworking, and since a knife needs a protective sheath, the leatherworking. I created a pattern for both blade and handle that was pleasing to my eyes and felt good in the hands, and started each knife with just a blank of wood and a rectangular piece of metal. 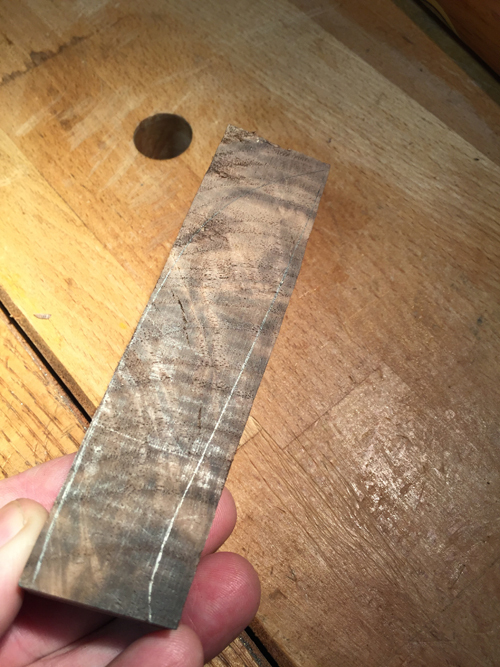 A blank of Claro Walnut, with the outline from my handle pattern, drawn on to show the intended grain orientation I wanted. Here I am cutting the knife blade out and used a hacksaw to make the major cuts. 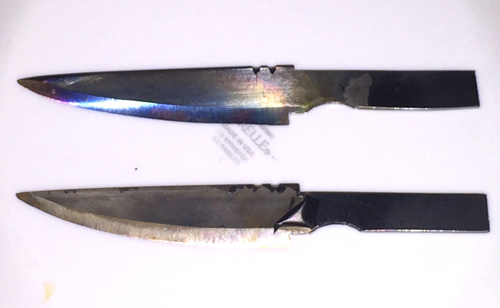 Two blades after heat treating. 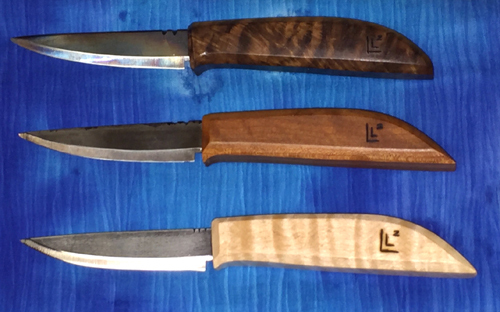 Three knives, in Cherry, Curly Maple and Claro Walnut. 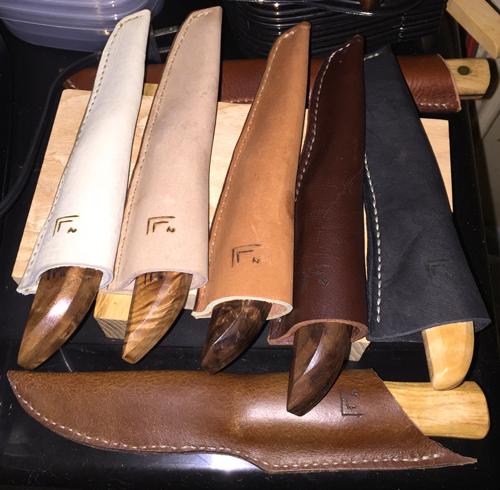 Knives in their leather sheaths. Most of the work I performed with these different mediums was with hand tools, other than using my powered grinder for the initial bevels on the blades. 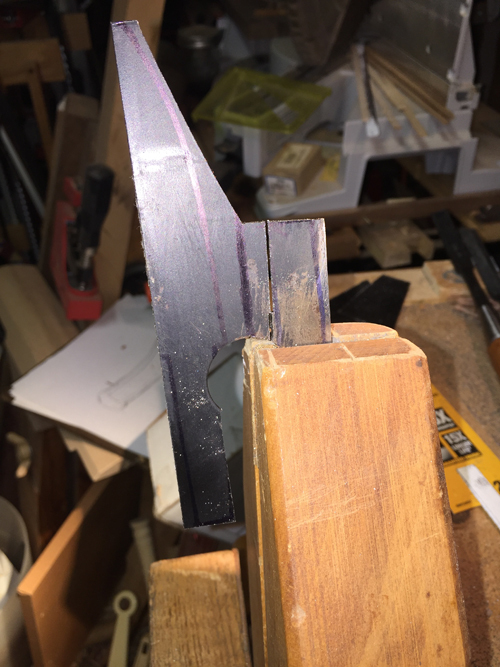 As you might imagine, there is a fair amount of time and sweat involved in working these materials from the rough blanks to the finished and functional knives. Perhaps some of this time and effort will show through to each recipient, increasing the perceived value or just making it that much more special. My wife is also making Christmas gifts this year, and they are a blend of media as well. She created chopsticks for her recipients, choosing and working with different types of woods, as well as making embroidered carry pouches. I got her a Bridge City Chopstick Master last Christmas (by her request) and this helps facilitate the process, but don’t think for a moment that you won’t need to apply your effort and sweat to have a great set of chopsticks! 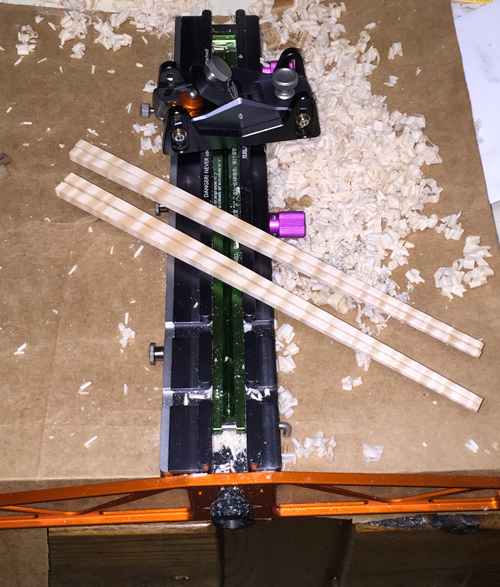 Two sets of finished chopsticks on top of the Chopstick Master, with the included hand plane towards the back. We’ve imbued lots of work and love into our gifts. I hope everyone has a wonderful and safe Christmas!